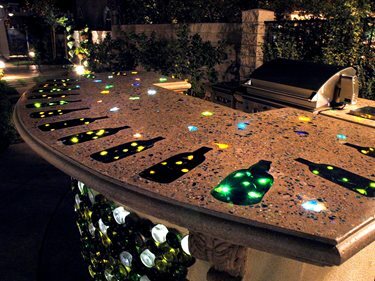 One of my favorite outdoor kitchen secrets is building countertops that come to life at night with the help of fiber-optic lighting cables. These cables can be cast directly into the concrete for fascinating effects limited only by your imagination. Use these examples and instructions as a guideline to help create your own party focal point. You hear about fiber-optics whenever people talk about telephone lines, television cable and the Internet. Fiber-optic lines are thin strands of optically pure glass or plastics that are capable of carrying light and/or digital information over long distances. For our purposes, we will deal with just the light-carrying properties of fiber-optics. Light in a fiber optic cable travels through the core by constantly bouncing back and forth. This allows the cables to bend and curve and still carry light from the main source of illumination. 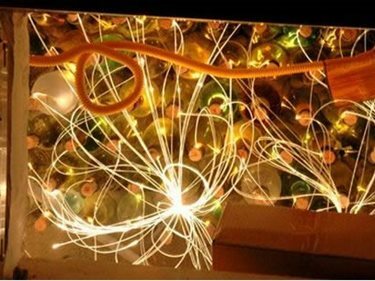 Scott Cohen describes how to add lighting with fiber optics in your countertops for an amazing glow in the evenings. An illuminator is the source of the light. It's basically a box with a bright halogen light and a bundle of cables held in place directly in front of the bulb. The bright white light is carried down the cables to create hundreds of points of light from just the one bulb. A typical illuminator will hold 250-350 fibers depending on how thick the fiber strands are. For even more interest, illuminators are available with a "color wheel" or a "sparkler wheel". Color wheels spin slowly in front of the white light bulb and change the color of light at the end of the fibers. They come standard with green, blue, magenta, and white color, but can be special ordered in custom color blends if you desire. Sparkler wheels can be used to create a twinkling "starry sky" effect. As the sparkler wheel turns, it varies the amount and location of the white light so the fiber ends fade and glow like the starry skies. The effect is both subtle and enchanting. Part of the magic of this technique is the fact that it always results in a unique, original work of art. The variability of the recycled glass pieces and curve of each set of cables means the effects will vary from piece to piece. This is art and the old expression "it's not cast in stone" does not apply here. For this reason, whenever I cast counters with fiber-optic lights, I always require complete artistic license from my clients. I advise them in advance to expect some areas of the counter to be brighter and others to be more subtle. Some glass chunks will catch the light during the day, others will only show off their sparkle at night. Clients who appreciate original art will be thrilled with the distinctive nature of their finished piece. But if a homeowner is not comfortable with the concept of artistic license, don't attempt to create a one-of-kind counter like this for them. Insights on Illuminating Concrete CountertopsAccording to Robert Sapp, a nationally recognized expert in the use of fiber optics in concrete countertops and inventor of the Illumistone™ line of premium concrete surfaces, "When I first invented the process, I thought that bars and restaurants would be the main application. I have found that clients often want fiber optics in bathroom vanities, and there are even applications for visually impaired clients." 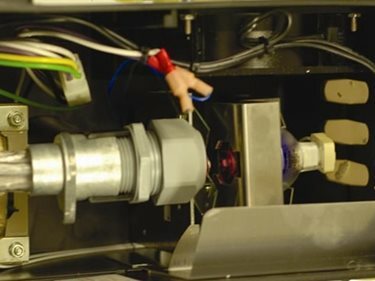 When it comes to safety, he says, "A separate illuminator provides the light - there is no electricity in the counter itself, so it is safe for outdoor and damp environments." 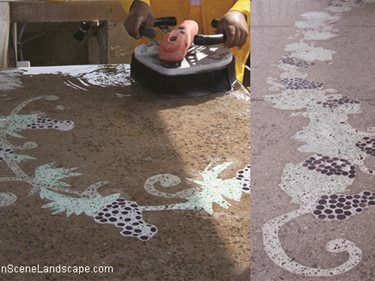 On this very custom counter I personally hand-seeded glass beads to mimic grapevines. Over 900 fiber-optic cables underneath fed the grapevine, and the counter was connected to a special order illuminator. Every couple of minutes the light would dart up the length of the vine with over 200 hand-placed cables for a shooting star effect. The remainder of the counter featured 700 additional cables that sparkled like a starry night. The completed project took 6 weeks to build and was one of my personal best. But the client was not satisfied. Not every client is ready to embrace the variability of an original masterpiece. Lesson learned; know your client and get your artistic license in writing.